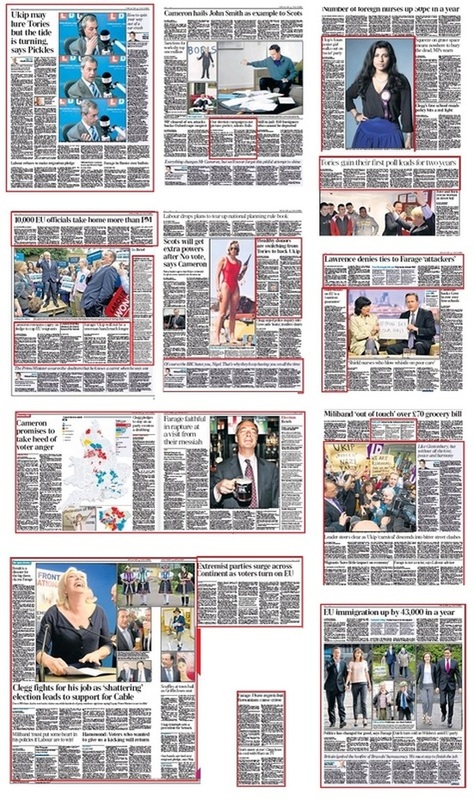 Election issues appear on eight of the ten front pages, although one relates to the Telegraph's bid to co-host the general election leaders' debates. 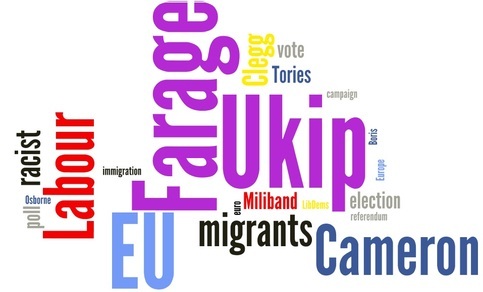 Ukip appears in five headlines, EU in three, and Farage and Cameron twice each. Labour is mentioned only once - after the polls closed - and Miliband, Clegg and the LibDems not at all. 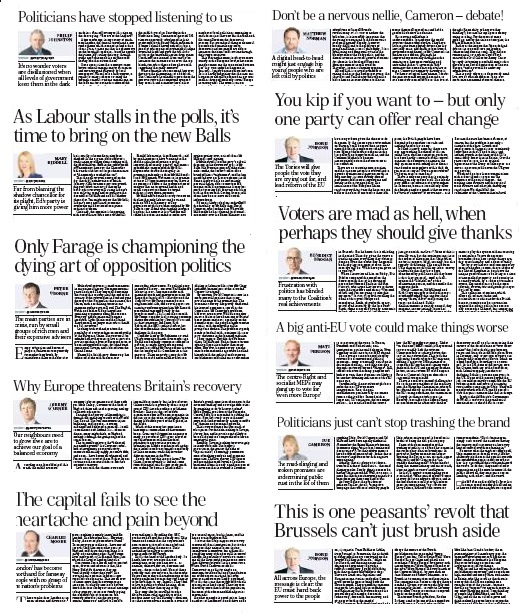 Only once in the two weeks before polling day did the Telegraph devote an entire page to issues related exclusively to the European or local elections: on May 17, the day after Farage's LBC interview. For the rest of the time, the polls had to take their chance amid the mishmash of "political" stories ranging from a Tory MP photographed in a swimsuit when she was a lifeguard 15 years ago to Boris and Dave rescuing a woman who collapsed in the street. On May 20, two days before the country went to the polls, there was nothing at all about the elections in the news pages, although Ed Miliband's pronouncement on the minimum wage merited six pars on page two - and a first leader denouncing the policy at twice the length. After polling had closed, the declarations were each covered with one-and-a-half page spreads, including a big map and half a page of results (not shown above) on Friday. "Farage" appeared in eight headings, Ukip in five and Labour in four. There wasn't a word on the Greens. 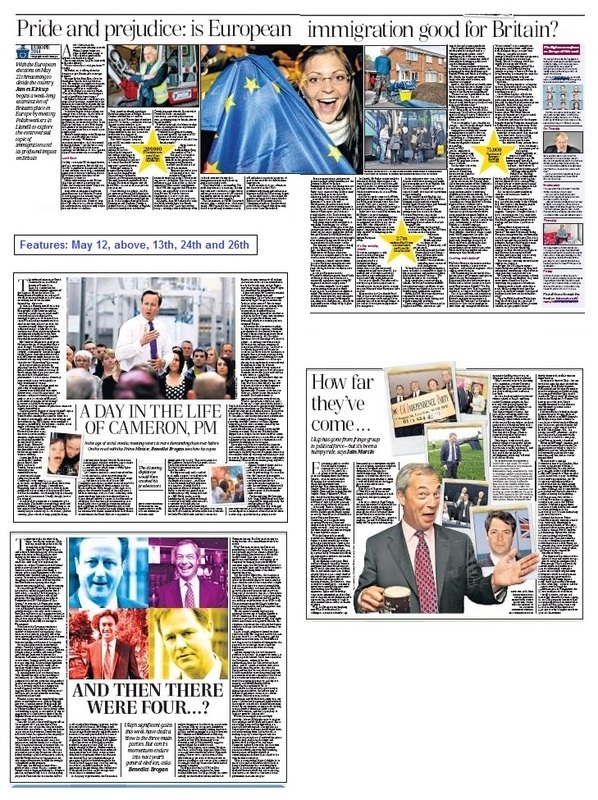 Farage also topped the picture parade with six - if you count the LBC triptych as three. If not, Cameron and Johnson shared the top spot with five each. Clegg appeared twice and Miliband once - in a montage of the leaders heading for the polls. "The Poles' work is outstanding. The pride they take in it is amazing. The way they look after a machine, it looks better and we get more use out of it. 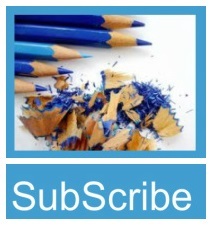 We spend less money and we do more business. And then we hire more people." The paper didn't have enough interest in its series, however, to print anything other than the first episode - everything else had to be accessed online. The follow-up pieces included Boris Johnson reminiscing about being the paper's Brussels correspondent, concerns about the advance of the far Right, German dominance and "what has Europe ever done for you". Other pre-election features were a day in the life of Cameron, the dawn of four-party poltics and a Ukip retrospective. Telegraph commentators wrote on the elections almost every day and cartoonists Adams and Bob used them as their topic on six of the ten days. Farage is overwhelmingly the central character. 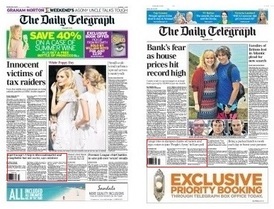 The paper ran half a dozen leaders, supporting Cameron, denigrating Miliband and warning of the dangers of Ukip. If there is one overriding reason for the poor turnout in local, European and even general elections it is this sense that it is a waste of time. For goodness' sake, even the public's vote last Saturday in the Eurovision Song Contest was ignrored...If we can't even influence the outcome of an over-the-top kitsch-fest, what chance do we have with something that really matters? I find it utterly amazing that we are approaching the climax of this so-called Euro-election campaign, yet there has been hardly a mention of this central question: the democratic question, the only question worth asking. After almost four decades as members of this club, do you want to stay in? Do you want reform? Or do you want to come out?